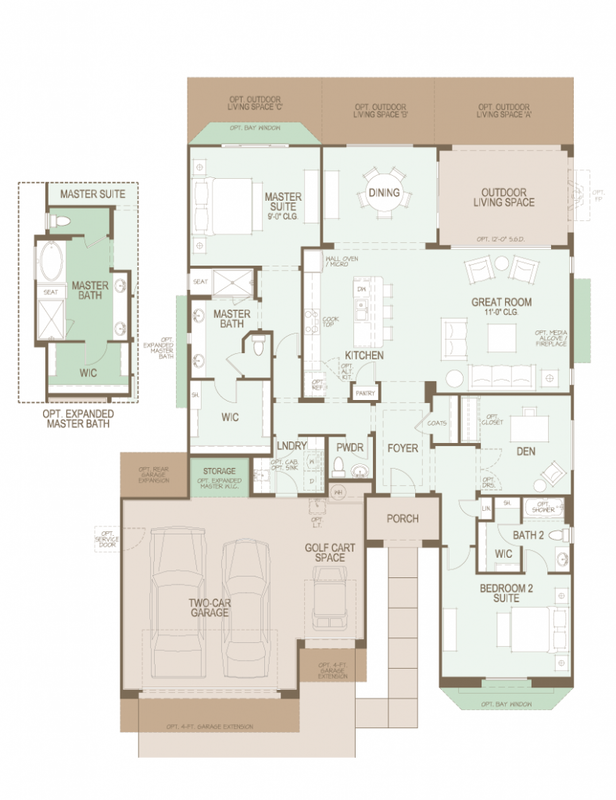 The SaddleBrooke Cortez Floor Plan is one of 8 available floor plans at SaddleBrooke. The Cortez Floor Plan is in the Premiere Series of Homes at SaddleBrooke that has a great room plan with 2,051 Sq. Ft.
For the couple that wants a retirement home or winter retreat with a casita, the SaddleBrooke Cortez Floor Plan may be for you. If you register at the builder’s site, you are on your own to work through the builder’s contract and all purchase decisions. Yes, the builder’s sales agent will work with you through the paperwork. They will answer your questions. BUT with who in mind? You or the builder they work for? Will they tell you there are homes for sale with the floor plan you want for less than it will cost you to build it? If you are considering a Robson Resort Community home in SaddleBrooke, SaddleBrooke Ranch or Quail Creek give us a call. We would be pleased to discuss your home buying interests and the many Tucson AZ lifestyle choices.